Disclaimer: This story in no way denigrates the French. The Institute does not want to offend its French members. They have a beautiful language. Just because they invaded England in 1066, we bear no grudge against them. Not at all. It’s all water under the bridge. Let bygones be bygones. We are all friends now. The Battle of Agincourt took place on October 25, 1415, in France. Shakespeare wrote a play about it. Most versions now in existence have expunged the tea bits. Henry, the fifth one, was King of England and a slice of France. He was continually excluded from tea parties in Paris. It was said a fellow would dress up as a dolphin and be most amusing at these gatherings. Henry liked a good tea party. He didn’t take kindly to not being invited. He was miffed. Henry, the man of action, acts. He raises an army, and, as all the history books will tell you, he marches his troops across the English Channel. Exactly how he does this is lost in the mists of time. He arrives in France very wet. This doesn’t improve his mood. He lays siege to several castles, and then yells some stirring words about getting into his breeches. Henry is keen to wear his new pants at the tea party. The sieges are terrible. The thirsty, tea-drinking rabble teem over castle walls, across drawbridges and make for castle kitchens. There, the battle-mad invaders brew up pots of tea. They devilishly force conquered French maidens to bring them biscuits and cakes. The victorious rabble soon becomes indolent under effects of French tea and cake. In no time, they are learning the French words for please and thank you. Henry won’t let his men idle long. His thoughts are on Paris, elegant salons, cups of tea, dainty cakes, and the chance to dress up as a dolphin, too. It’s been raining for days, and it’s raining now. He’s pushing his troops forward. Then, just outside the town of Agincourt, he sees some 30,000 French on the hill. 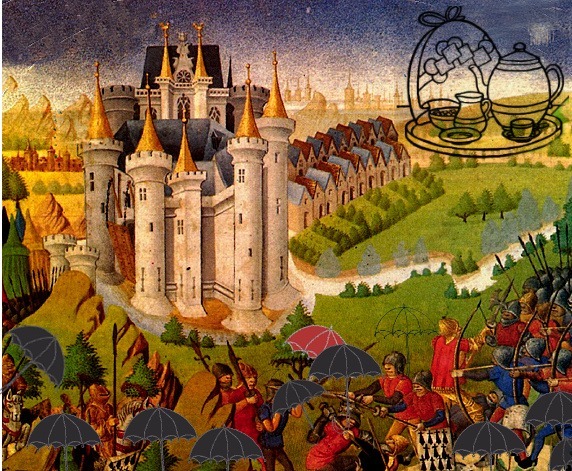 They taunt the English by holding up giant teacups on the tops of their umbrellas. This is strictly against the rules of chivalry. If the sight is not enough to terrify and madden the soggy English, the French now cry, in one well-rehearsed sing-songy voice, “You’re not coming to our party.” They do this of course in French, so its devastating effect is lost on the English, except for a few noblemen who had been privately educated. These cleverly put their fingers in their ears. With that, a loud hurrah! and off they go to win a decisive victory. Henry gets to go to the tea party, where he meets a nice French girl. He slips her a few cups of broken orange pekoe and, under the influence, she consents to be his girlfriend. Now formally admitted to the sumptuous Paris tea party, Henry also takes to the habit of dressing up as a dolphin.